A civil engineer from Alabama rescues the Beetle Cat from the brink of extinction. I sailed a Beetle Cat for the first time in 1999 on the Mystic River in Mystic, Connecticut. It was one of the Seaport Museum’s livery fleet and in fine condition. Sharon Brown, at the time enthusiastic keeper of the Mystic Boathouse, showed me the ropes — one halyard for the throat of the gaff and one halyard for the peak. She told me to hoist the sail by tugging both halyards simultaneously until the throat reached maximum hoist, belay that halyard, continue raising the peak until all the wrinkles flattened, and then belay that halyard. After a few words about minding the traffic on the river, Brown sent me on my way. A light breeze moved the little hot tub of a boat at a hypnotic pace as I lounged on the floorboards in her massive cockpit, one hand on the tiller and my free arm draped over the coaming. Yes, a 12-by-6-foot catboat has a massive cockpit, and aboard the Beetle, it feels even larger, because the boat doesn’t have benches. This little yacht was so stable, especially in the light air I experienced, that I stayed on the same side of the cockpit for every tack. I might have dozed off, but Brown’s warning about the small-boat traffic and the gentle pressure of weather helm kept my attention. John H. Beetle designed the Beetle Cat in 1920. 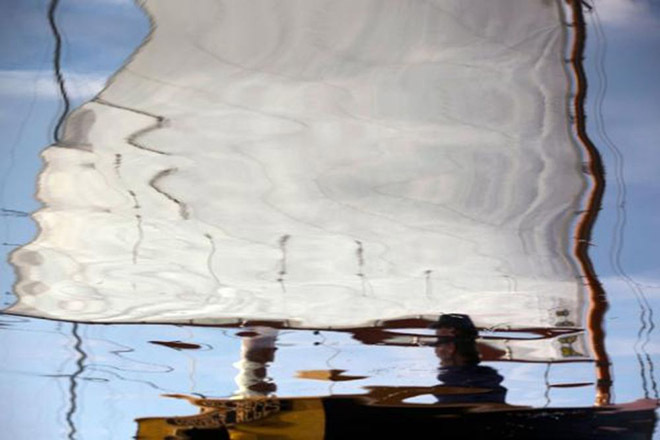 His father, James Beetle, had founded the Beetle Boat Co. in the 19th century to make whaleboats for the thriving whaling industry in New Bedford, Massachusetts. 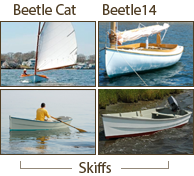 John Beetle respected the many wholesome characteristics of the Cape Cod catboats and thought a small daysailer based on the workboat model would make a perfect boat for the children in the family. His design had the single gaff sail, shallow draft, centerboard and barn-door rudder of her ancestors. Her performance in the first season afloat impressed the locals, and orders for the model followed. 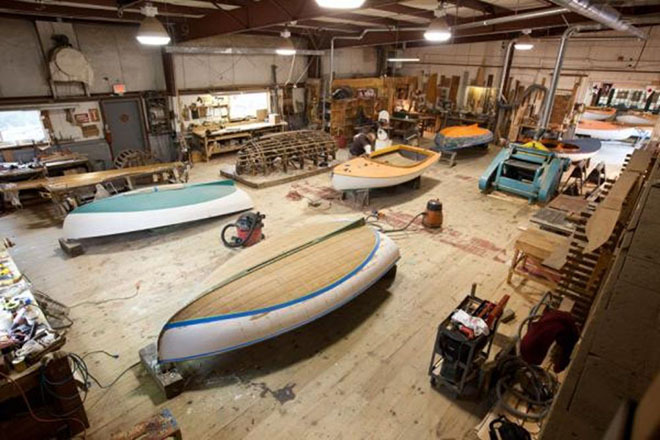 By 1921, the Beetle Boat Co. put the 12-foot catboat into production, employing the assembly line method that allowed the shop to build a 29-foot whaleboat in 48 hours. After the Beetles established the design of a boat, they made a pattern for each stock part, and then using these patterns, they cut the parts, labeled them and placed them at the appropriate locations along the assembly line. They built the lapstrake whaleboats upside down over male molds, installing the steam-bent ribs after the hull had been planked. This method, adapted to the carvel construction of the Beetle Cat, allowed the company to keep the price within reach of the average enthusiast. Horace S. Crosby, a boatbuilder in Osterville, Massachusetts, constructed the first Cape Cod catboat in 1860, and he fashioned her to deal with the big seas, strong currents and shoals inherent to waters off Chatham, Hyannis, Osterville and Falmouth. Crosby gave his working catboats high bow sections, which contribute to the graceful sweep of the sheer line. More important, though, the bow helped support the mast, which sits so far forward that the shrouds and forestay don’t have the best of staying angles. Substantial freeboard forward also prevents solid water from shipping aboard. Although the low freeboard aft complements the sheer, its main reason for being is to ease the handling of lines and traps. Same for the catboat’s generous beam: It enhances form stability, so the crew may work without fear of being pitched out of the boat. Even aboard the tiny Beetle Cat, a person of average size standing on the side deck heels the boat only a few degrees. The huge single sail made the catboat easy to handle, allowing a fisherman to work alone, though he typically carried a mate. On the downside, that sail became unmanageable in a blow, so the crew had to watch the weather and reef before the wind increased and the seas built. Racing has been part of the Cape Cod catboat’s life since the beginning. The late Howard I. Chapelle in his book American Small Sailing Craft (W.W. Norton & Co. Inc.) writes: “ … the crews of the boats consisted of no more than two men, and the boats were raced to market. In other words, shoal draft, speed, seaworthiness, weatherliness, handiness … were necessary features of design.” Later in the chapter, he tells us that racing, which caused the rigs to grow in size and the boats to become truculent, compromised the catboat’s wholesomeness, tarnishing its reputation. The Beetle Cat’s reputation isn’t in any danger of being sullied, because John Beetle designed it to be as well balanced and safe as the type permits. Some sources reckon that more than 4,000 Beetle Cats populate the world and that most of them live along the East Coast from Maine to New Jersey. I seldom argue with “sources,” and I’ve seen enough of these charming 12-footers during my travels to accept the veracity of this figure. Every time I see a Beetle Cat under sail or dancing around its mooring ball, I want one. They are downright lovable — the plumb stem and proud bow like the “pug-nosed dream” in the tune “Polka Dots and Moonbeams.” Sailing one simply increases my desire. 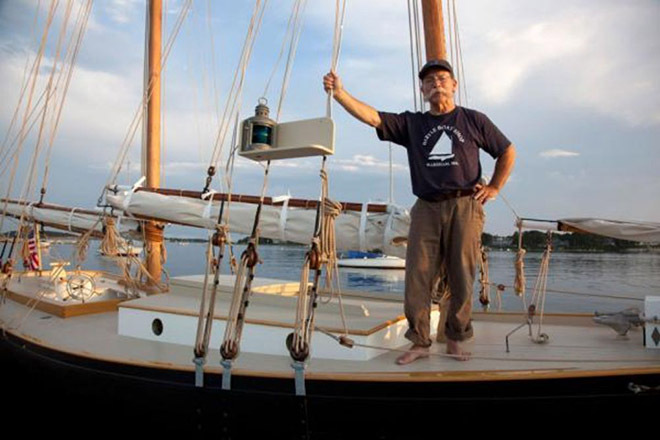 Bill Womack (above), the 68-year-old CEO of Beetle Inc. and an energetic fireplug of a man, treated me to my second sail aboard a Beetle, this time on Buzzards Bay off Wareham, Massachusetts. Very light air, the occasional sprinkle of rain and the threat of a thunderstorm from the west urged us to abandon the outing, but the occasional puff teased us into chasing every patch of cat’s paws we saw. In spite of its two-to-one beam/length ratio, the Beetle Cat doesn’t have very much wetted surface area relative to the power of its 100-square-foot gaff sail. The Beetle ghosted along rather nicely, another characteristic that endeared catboats to the working watermen of Cape Cod before the advent of small internal combustion engines. Beetle Inc., now located in an industrial park in Wareham rather than the waterfront, is the fourth incarnation of the company. John Beetle died in 1928, leaving his daughter, Ruth, to assume management of the Beetle Boat Co. She oversaw the company’s transition from building whaleboats to Beetle Cats, which continued until World War II interrupted production. 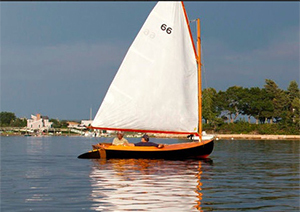 After the war, Ruth’s brother, Carl, became interested in the development of fiber-reinforced plastic as a boatbuilding material, and he transferred the rights and title of the catboat to the Concordia Co. of South Dartmouth, Massachusetts — ushering in the era of Leo J. Telesmanick, the legendary craftsman who ran the Beetle shop at Concordia. Although the Concordia Co. changed hands twice during Telesmanick’s tenure, which lasted until 1983, the Beetle Cat division remained part of the package until Charlie York bought it in 1993. He ran the operation until 2003 but couldn’t keep up with the demand for new boats, off-season storage and repairs. That’s when Womack bought Beetle Inc.
Womack is a civil engineer. Although he was born and raised in Alabama, he can trace his roots to the Mayflower’s landing at Plymouth Rock. During the 1950s, he visited Cape Cod with his parents and remembers seeing Beetle Cats everywhere. After earning his degree from Georgia Tech, he spent four years in the Navy, some of that in Vietnam working with SEAL teams. In 2002, Womack commissioned Charlie York to build a new Beetle for him, and by the spring of 2003, it still wasn’t finished. Womack told York that he was going to pick up the boat, done or not, and during the course of their conversation at the shop, York said that, for the right money, Womack could buy the whole operation. Boat in tow, Womack headed for home. “I was 10 minutes up the road,” Womack said. “I called him, and it’s the only time in six months he answered the damn phone.” Womack returned to the shop, and within 15 minutes he and York made a handshake deal. Under York’s management, Beetle Inc. built three or four boats a year, stored maybe 25, and grossed about $150,000 annually. Since Womack has been CEO, the company stores 180 boats, builds 10 to 12 new ones annually and has a thriving business in repair. The crew also has built an Alerion, a 28-foot Hanley catboat, a Beetle Cat 14 and a healthy number of flat-bottom skiffs. Gross earnings have reached about $1 million annually. “Every penny we’re making, we’re putting right back into the business,” Womack said. At the Leo J. Telesmanick Championship Regatta, run out of the Weekapaug Yacht Club in Westerly, Rhode Island, this past August, I spoke with one woman who lived within sight of the race course and had been watching Beetles for years. She longed to have a boat of her own, and when the youngest of her children entered adulthood, she bought a Beetle. She raced the regatta with her teenage daughter. One of Beetle Inc.’s customers bought his seventh catboat when he was 91. He’d courted his wife in a Beetle prior to World War II, where he was a hero in the Pacific theater. Beetle Cats are so appealing that they have a life of their own. 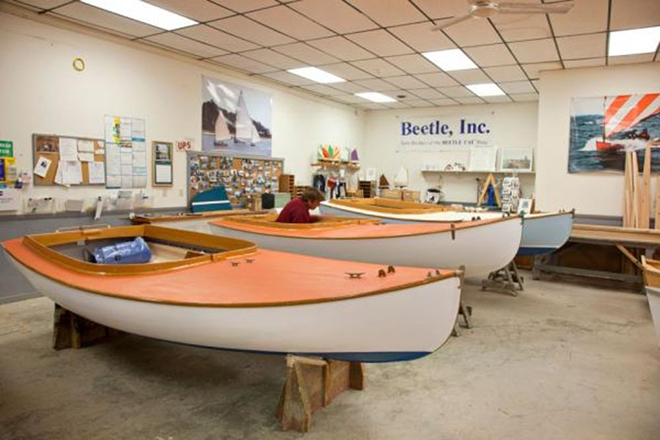 The International Yacht Restoration School in Newport, Rhode Island, restores a handful of Beetles every year, buying parts from Beetle Inc. The New England Beetle Cat Boat Association provides owners and would-be owners a place to get advice and make contact with other enthusiasts. Now that Womack and his band of craftsmen have the reins at Beetle Inc., the class has a bright future. SAIL AREA: 100 sq. ft.